I have the CHEAPEST haul ever for you today. I went to Boots the other day and picked up a tub of "Rose Lips" Vaseline (my HG lipbalm) and a bottle of Vaseline's "Healthy Hand & Nail Conditioning" cream. I had never used this stuff before, but it's bloody brilliant... and the smell is delish!! I also received a wonderful package in the mail from Rita (who also has a beautiful blog which you can visit by clicking... HERE) who had a mini competition the other day, which I won!! She sent me the dreamiest photo of 100 Monkeys (including the gorgeous Jackson Rathbone) and a box with a mini Tarte eyeliner and mascara. 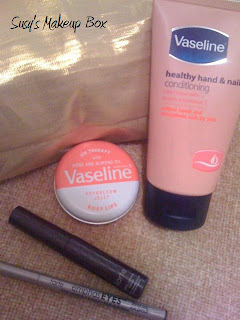 I have used these products a couple of times, but I will do a proper review soon!! Oh I like that hand cream... you know I'm always looking for something that will work for my over washed hands, and now that I've taken my fake nails off I'm always trying to condition them. Let me know how that stuff works out. Glad you Liked that Pic.. I still think it's funny there is no faces.